When looking from the outside in, established producers and co-founders Doug DeLuca (Jimmy Kimmel Live) and John Watkin (Planet Grande) have dream jobs. 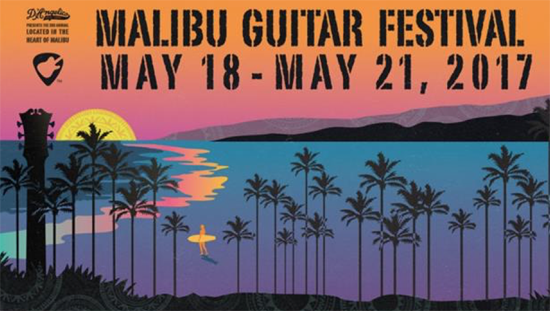 However, they both admitted that creating the Malibu Guitar Festival and now producing its third year has been a childhood dream come true. Like many teenage boys, playing guitar was a beloved pastime for both DeLuca and Watkin, longtime residents of Malibu….in fact, Watkin still plays in bands to this day. Watkin’s grandmother taught him to play the ukulele at just nine years old…he added, “I do a pretty mean uke version of Stairway to Heaven!” DeLuca’s mom gave him his first guitar when he was in second grade just after he had a tonsillectomy. He was in a variety of metal bands growing up. The festival, presented by D’Angelico Guitars was originally conceived by co-producers Doug DeLuca, John Watkin, and Alejandra DeLuca in 2015 and was a huge success. Deluca and Watkin run the production side of the event, while Alejandra (wife of Doug DeLuca) took over the charity aspect of the festival. Alejandra DeLuca, a meditation/motivational coach and owner of Manifesting Success and Wellness has been active in her Malibu community. She has gathered deserving local nonprofits who will benefit from the festival. Offering four days of live music, the event opens with an all-star charity benefit at Casa Escobar with surprise guests. John Hiatt, Robby Krieger, Hunter Hayes, Steve Ferrone, Waddy Wachtel, Bernard Fowler, Scott Thurston, Kenneth Brian…are just some of the guest musicians one can expect. The weekend continues with Friday night’s “Hot Licks.” Steve Vai headlines on May 19 at Casa Escobar. The evening showcases several talented female musicians such as Nik West, Lari Basilio, Gretchen Menn and Zepparella. See full lineup of each day on website. On Saturday, the main event will run from 11:30am-10pm and features heavy hitters Mick Fleetwood Blues Band, Jamtown featuring Donavan Frankenreiter, G. Love & Cisco Adler, and the list goes on and on. Finally, to wrap up the weekend celebration of guitar legends, the Rolling Stones Brunch pays homage to the fathers of Rock n’ Roll. The brunch will feature stories from musician/author Andy Babiuk’s book…Rolling Stones Gear: All The Stones’ Instruments From Stage To Studio as well as live performances by the Tearaways, Brooke Halpin and more. Since inception, Alejandra DeLuca said she wanted to feature a charitable aspect to the festival and help grassroots organizations. The opening night which kicks off the festival is now a benefit. “This is an opportunity to also have a taste of the festival prior to the main festival day in a more intimate venue.” She stated that awareness for these nonprofits was an added benefit. THERAsurf celebrates the healing power of the ocean. Children experience surf therapy through the organization’s programs…proving to create a powerful impression not only on the child but the family as well. The third charity to benefit is the Karl LaDue Wodakota Foundation, a nonprofit organization committed to the education of native youth with knowledge and skills that enable them to embrace their traditional heritage and culture. Alejandra said that since Malibu is Chumash land, she felt there was a need to connect the festival with those roots. At an preliminary producer meeting, she had a profound experience. “An osprey, a white eagle, kept circling above us for a long time and pretty close. I had a very strong sense of communication with that eagle in the moment, and felt we were given the blessing of the land.” She later learned about Chief Arvol Looking Horse from a close friend who had interviewed him while he was peacefully protesting against the Dakota pipeline. “In that moment, I felt the connection between the white eagle and the Chief,” said Alejandra. “It was meant to be.” Malibu’s ceremonial Elder, Mati Waiya, will present the award. Additionally, Alejandra explained that choosing Robby Krieger for the festival’s first Life Achievement Award was an obvious choice due to the timing of this year being the 50th anniversary of The Doors. An exceptional musician and guitarist, Krieger participated in the first inaugural Malibu Guitar Festival. “We believe that it is in giving that we receive,” said Alejandra. “Music is about giving. Music goes out — it is an evocation, an exhalation. By giving, we hope we can ‘ignite’ the desire of others to give and to help. Her husband Doug Deluca added, “It really is about music and art bringing people together for great causes. What could be better or more fun?